We designed our venue to make it easy for couples to have the aspects they want without the headache of piecing it together, and without the hidden costs that often come with booking individual vendors. Wedding packages begin at $6,000. schedule a free consultation with an event coordinator. Weekend dates are still available in every month for 2019-2020. 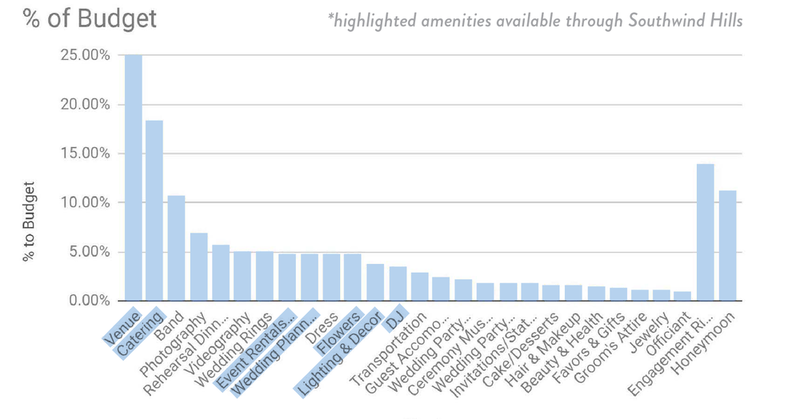 Couples spend the most on venue and catering, followed by the engagement ring and honeymoon. Individually hiring vendors is a common reason why couples go over budget because many of the services couples assume will be provided when booking a vendor actually end up being additional charges. Details like lighting & decor, linens & dinnerware, and set up & tear down are often additional charges not disclosed in the initial venue meeting.